The Book Barn is the iconic home of our Berkelouw Book Business and is located on beautiful Bendooley Estate. 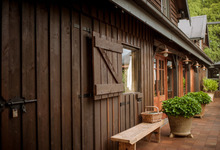 Built early last century, and sitting just outside the quaint Southern Highlands village of Berrima, the Book Barn has recently been transformed. The renovations highlight its exposed timber beams and cathedral ceilings, now featuring huge rustic iron pendant lights. The Book Barn is a book-lovers dream, housing tens of thousands of new, secondhand, rare and antiquarian books. At the heart of the Book Barn is an enormous stone fireplace, inviting you to sit, relax and enjoy. Our Rare Book Department is also sited on Bendooley Estate, in another barn just a little further down the lane. The Book Barn is a multi-functional space. It operates as a bookshop by day, as well as housing the Bendooley Estate Restaurant and our Cellar Door where you can enjoy coffee, lunch or a glass of wine. For weddings and special events, the scores of bookshelves are integrated into the end of the barn and it transforms into a magical space. Bendooley Estate Restaurant and Cellar Door - Please use the link to the 'restaurant page' to confirm opening times. Phone 4877 2235 – bookings advisable. Wine tasting - Groups welcome by appointment 4877 2235. The Book Barn Cottage is located just down the lane from the Book Barn on Bendooley Estate and is available to rent. It is the perfect country retreat for couples, friends, families and book lovers. Formerly the gatekeeper’s lodge of the historic 1839 Bendooley Homestead, this fully self-contained, spacious two bedroom cottage has been lovingly restored and completely refurbished in a warm, contemporary style. The Book Barn and the Book Barn Cottage are both situated on the historic Bendooley Estate. Located just outside the village of Berrima and a ten minute drive from the town of Bowral in the NSW Southern Highlands, it is approximately 1.5 hours from Sydney and 2 hours from Canberra. If using Google Maps or a navigator please use Berkelouw Books as your destination not the actual road number. Keep up to date with news and events at our Book Barn store. Please check our news page for dates that we close early due to private functions.